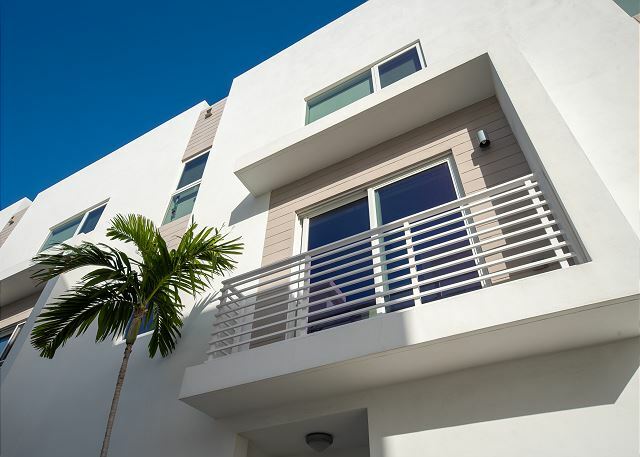 Seabreeze - New Tri-Level Modern Townhome. Walk to Cafes and Beach. Vacation rental house. Sleeps 9, 4 bedrooms, 4 bathrooms. No pets allowed. 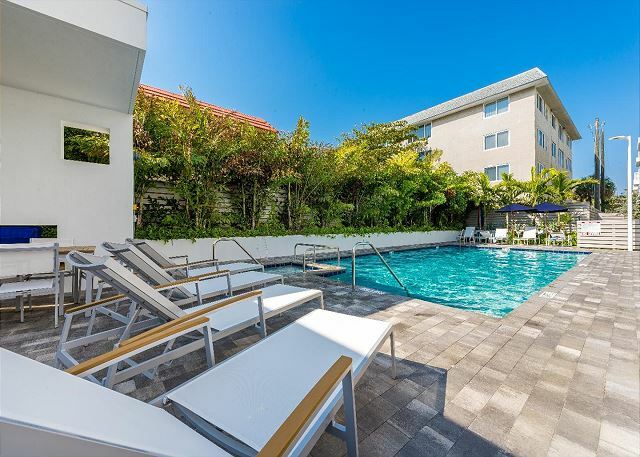 Relax poolside after spending the day sun tanning at the beach across the street. The 60” flat screen TV in the living room is perfect for watching late night shows. Seating for 6 at the elegant glass dining table and crystal chandelier sets the mood. Seating for 4 at the kitchen bar is ideal when having a quick breakfast or lunch. 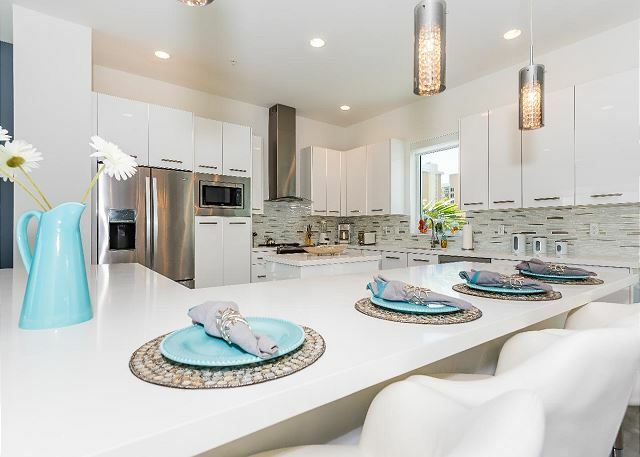 Ample counter space helps with dinner prep in the modern kitchen. 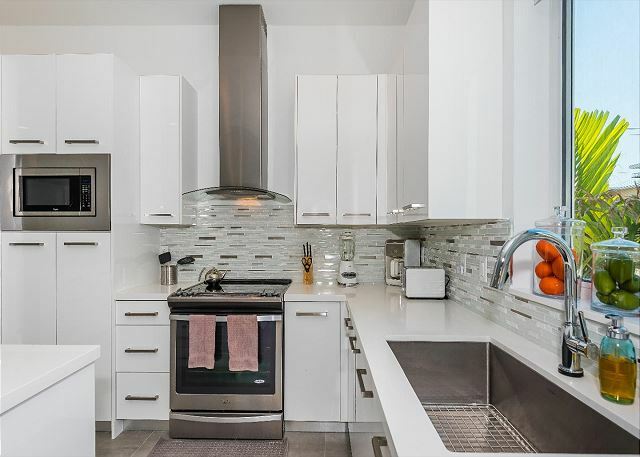 Bright kitchen with modern appliances and island makes cooking fun and easy. Natural light from the picture window fills the welcoming kitchen. 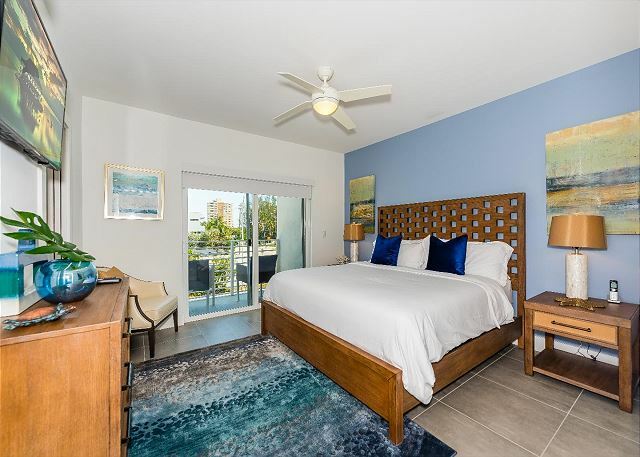 The master bedroom with king-size bed has a balcony that overlooks the ocean. 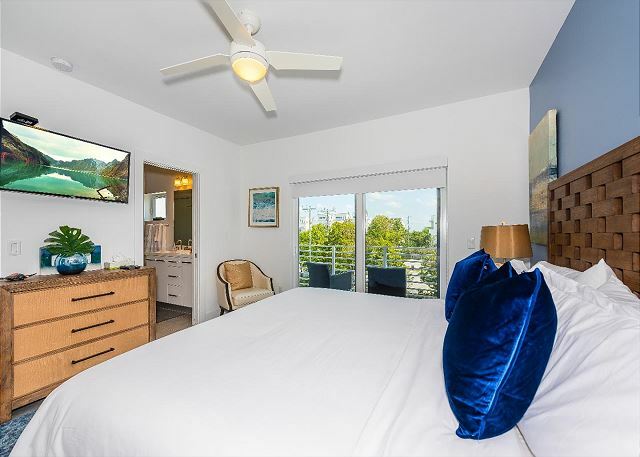 The 32” flat screen TV in the master bedroom is great for relaxing and watching your favorite movies. The master suite is elegantly designed with pretty blues yet comfortable and inviting. Enjoy a hot shower or soaking tub after a full day boating along the ocean shores. 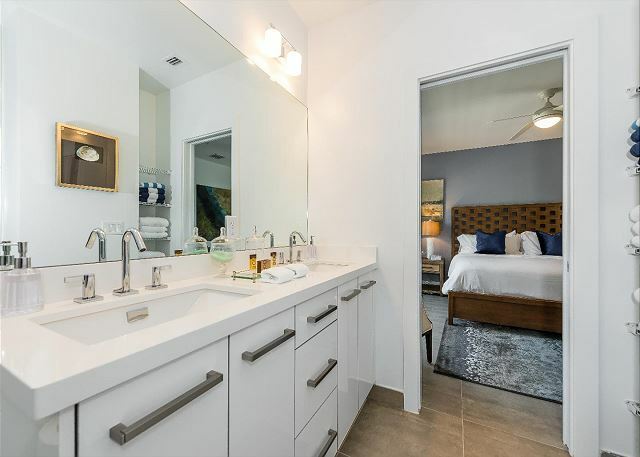 The master en-suite bathroom with double sinks is convenient for partners to share. 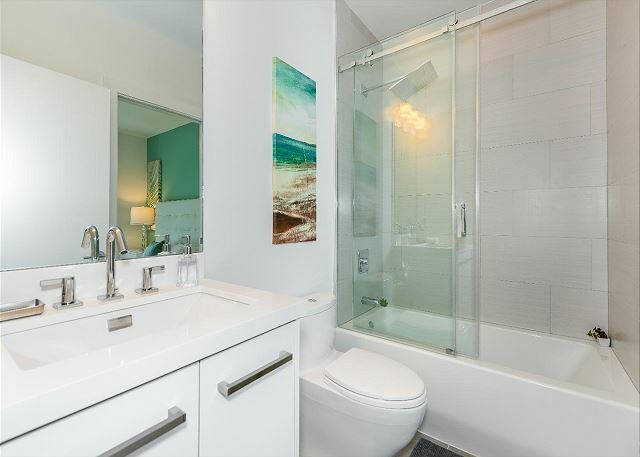 The master en-suite bathroom with a large walk-in shower and a soaking tub is soothing after a fun day at the beach. 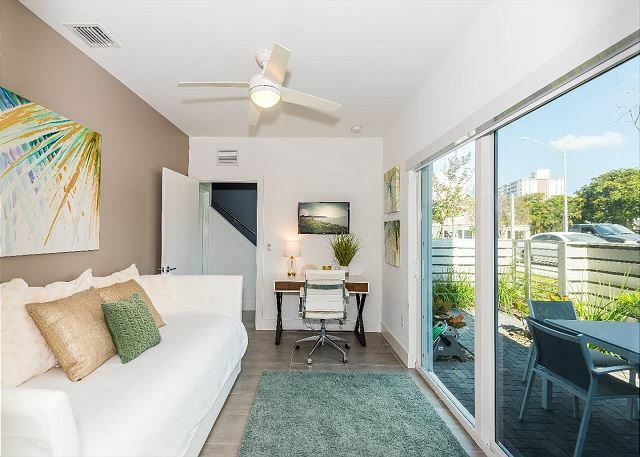 The ground-floor bedroom is outfitted with a day bed and sliding glass door out to the front courtyard. 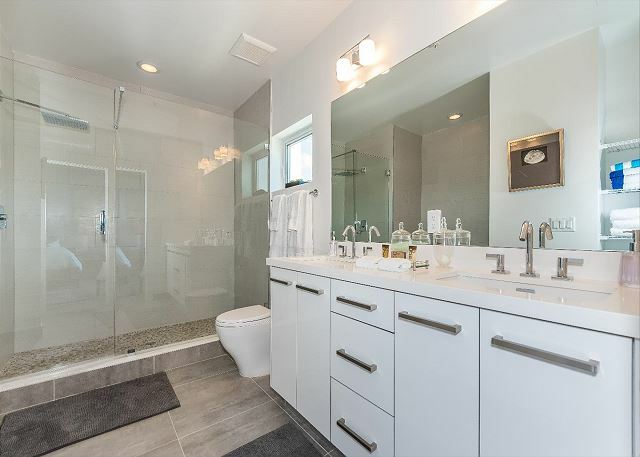 The half bathroom with picture window offers room for everyone to use. 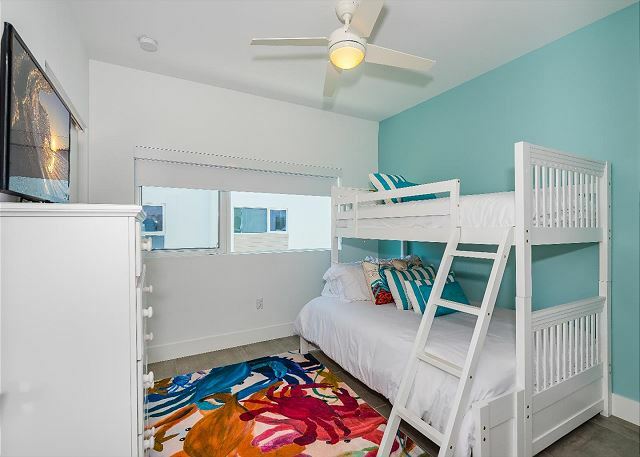 Bunkbeds in third guest bedroom allows room for kids of all ages. The second bathroom with tub/shower combo with glass door and rain shower head is relaxing after sunning at the pool. The fourth bedroom with full-size bed and white furniture is colorful and cheerful yet comfortable and spacious. 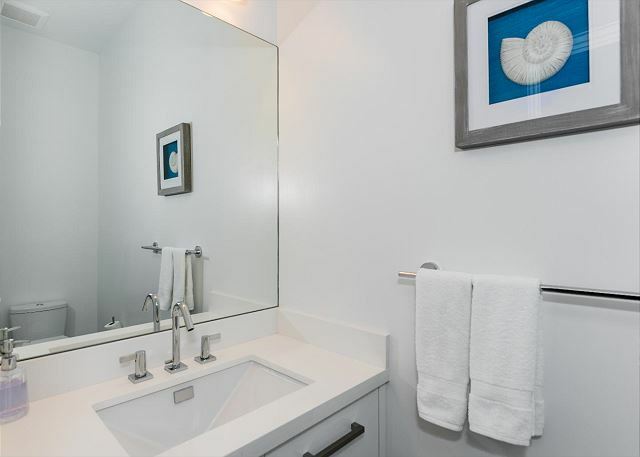 The third bathroom is beautifully appointed with the finest fixtures and finishes. 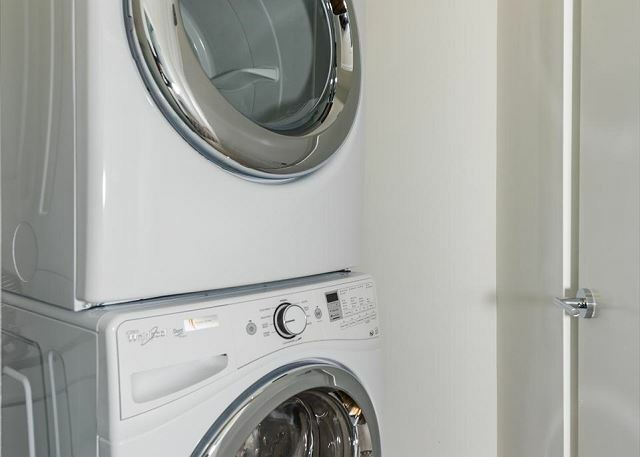 The modern stackable washer and dryer are high energy and efficient. 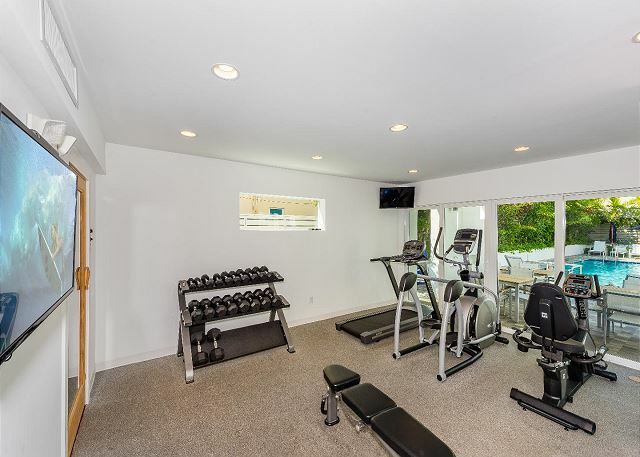 Start your day in the on-site gym with a quick work out with weights. Get a full cardio work out on the state-of-the-art equipment while overlooking the pool area. 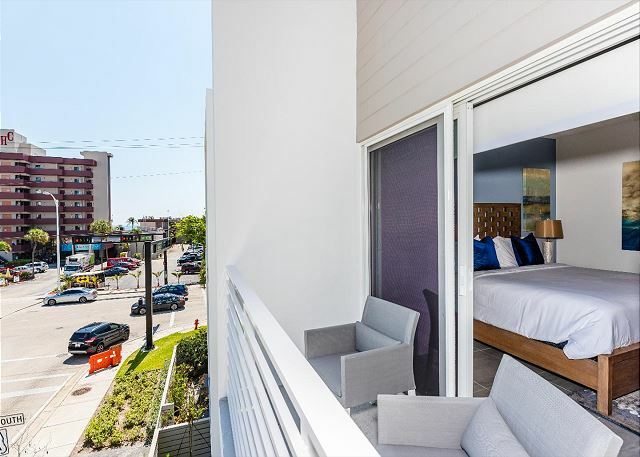 Take in some fresh air while enjoying the outdoors on your private balcony. 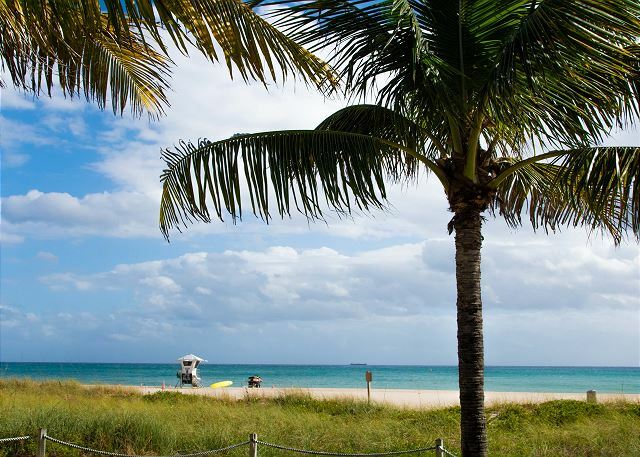 Relax under the shady palm trees lined along the ocean. Bring your surfboard and catch a wave. 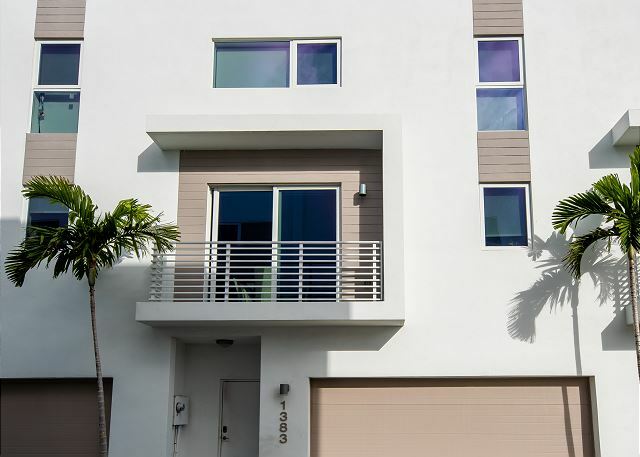 Modern tri-level townhome just steps from the ocean. Watch the sunrise over the Atlantic Ocean. Magnificent views are seen from the townhome community. 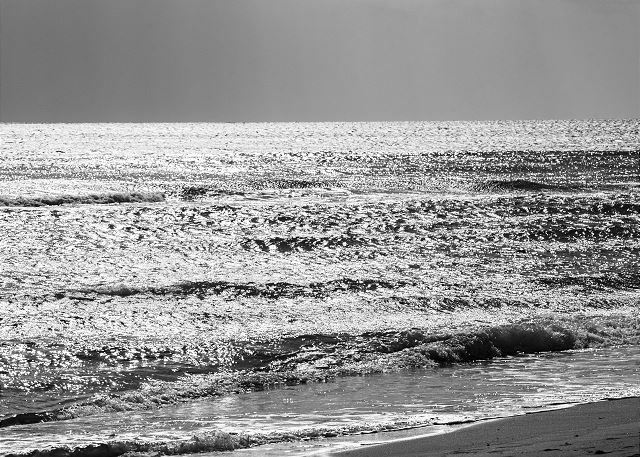 Take a long romantic stroll along the ocean's shore. 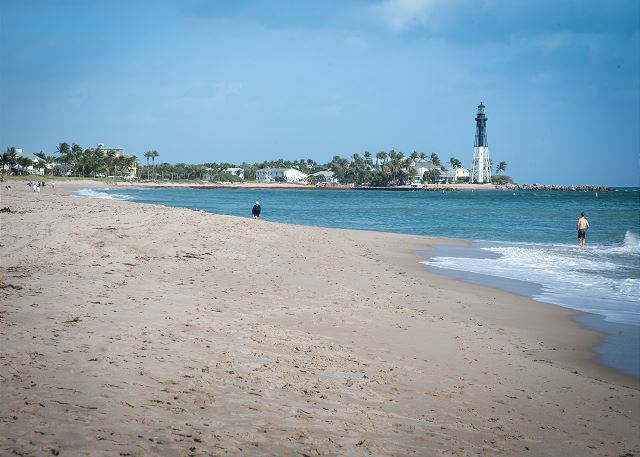 Welcome to Pompano Beach where you can walk one block to the ocean. 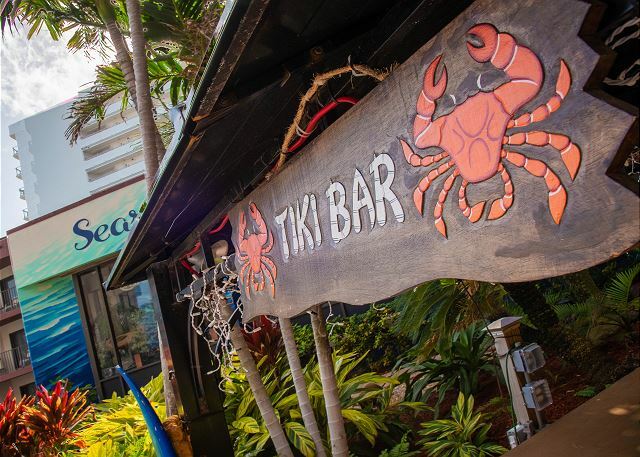 Check out the tropical drinks at the Tiki Bar directly across the street. Directly across the street is the beach where you can see the lighthouse. 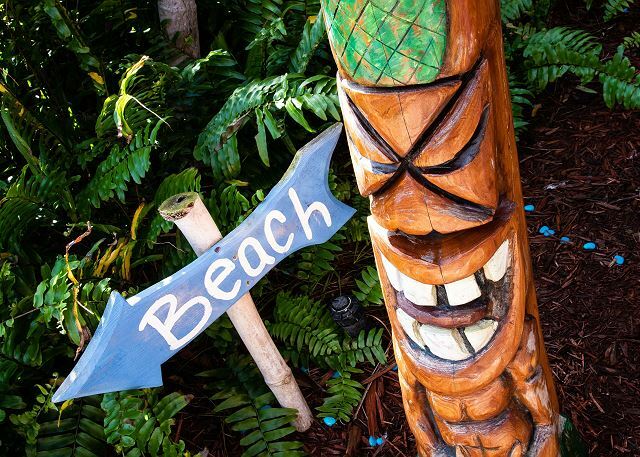 Lush landscape, pool and beach are walking distance from your vacation rental. Open and airy, the main living space, on the second floor, includes the living room, kitchen, and dining room. 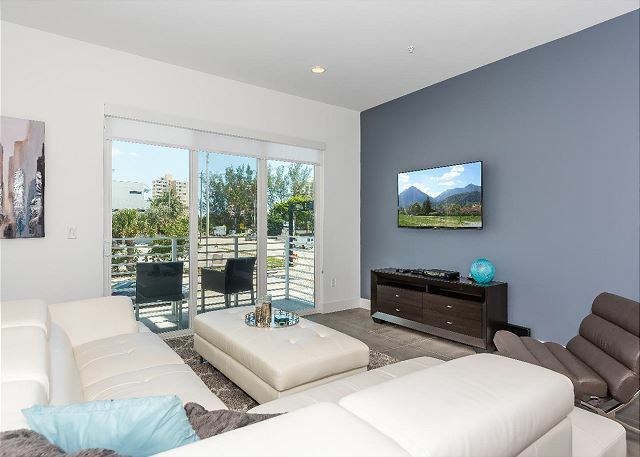 With high ceilings and lots of natural light from two sets of sliding glass doors, it’s a great spot for entertaining. 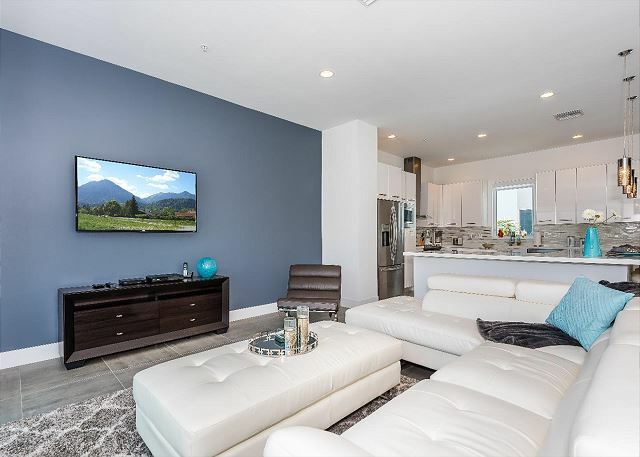 Even quiet nights in feel luxurious thanks to an oversize white leather sectional and 60” flat screen TV in the living room. A convenient half bath off the living room, laundry with high-efficiency washer and dryer, and parking for two cars in the private garage. Four bedrooms provide plenty of space for 10 to sleep comfortably. The master bedroom features an awesome king bed, 32” flat screen TV, and accent chair. Pamper yourself in the master en-suite bath, where you’ll enjoy a double vanity, large walk-in shower, and a soaking tub. 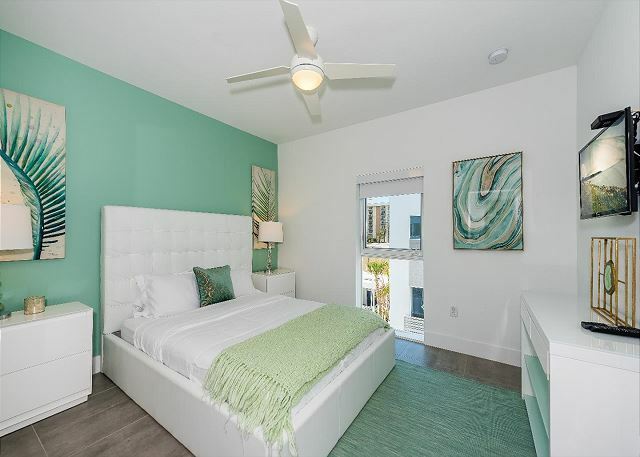 Enjoy privacy and quiet in the ground-floor bedroom, outfitted with a day bed, 22” flat screen TV, and sliding glass door out to the front courtyard. 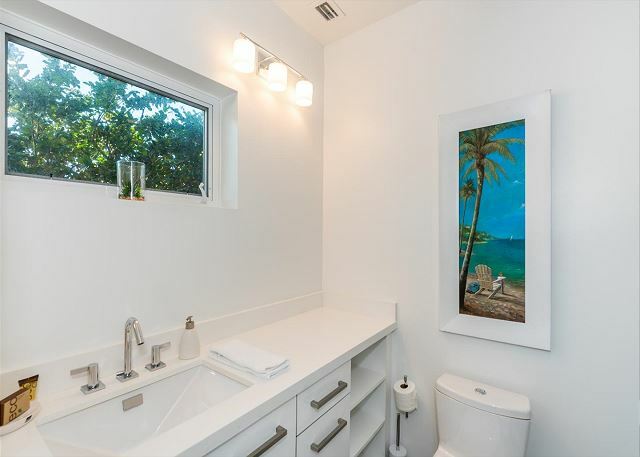 Bright and white, the en-suite bathroom has a walk-in tiled shower. One third-floor guest bedroom comes with a twin-over-full bunk bed, the other has a Queen bed. 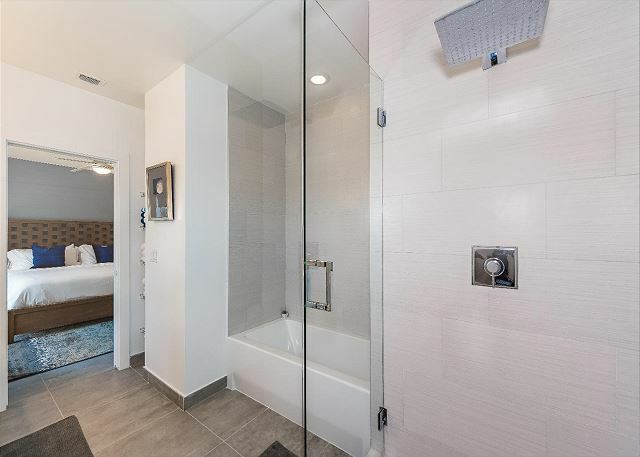 The third-floor full bath has a door to the fourth bedroom and the main hallway, as well as tub/shower combination with glass door and rain showerhead. 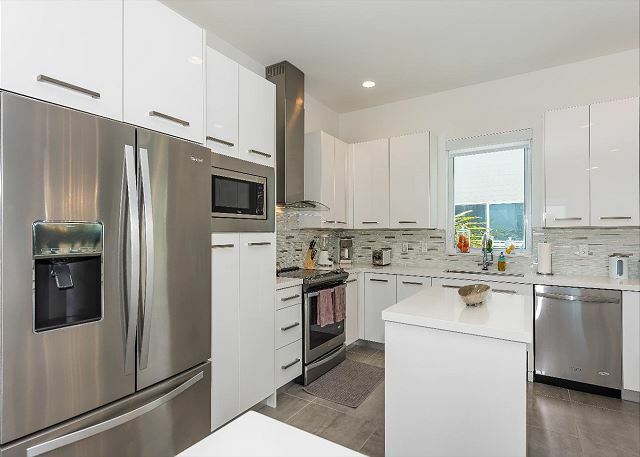 Gourmet chefs and cooking newbies alike will love prepping meals in the gleaming white kitchen with top-of-the-line appliances and two islands. Combining sophistication with comfort, all of the bedrooms and bathrooms have contemporary furniture and finishes. Feel like you’re dining at a five-star restaurant at the six-person glass dining table with sleek white leather chairs. The large L-shaped island in the kitchen seats four more on chic bar stools. Enjoy a private courtyard with a patio set for four. Splash around in the shared pool and stay active in the fitness center with a good selection of workout equipment. 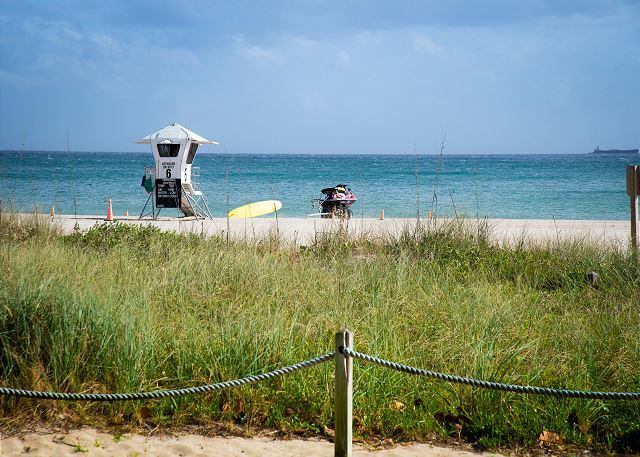 The soft, white sand and warm waters of the Atlantic Ocean are just steps away. 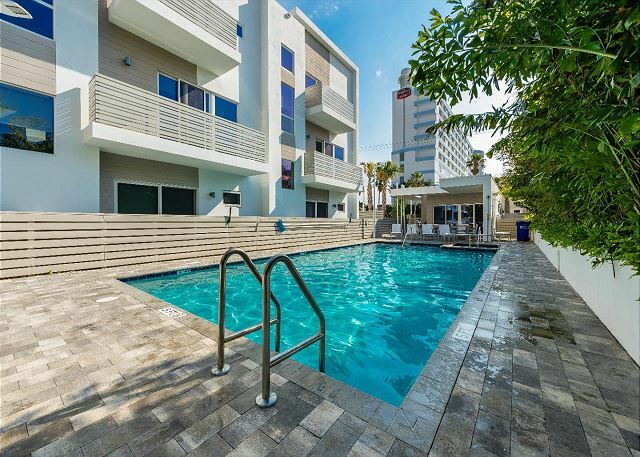 You will Indulge in the finer things in life at this posh new modern townhouse with large pool. Directly across the street from the beach and al fresco dining, this property belongs on the cover of Home and Design Magazine! 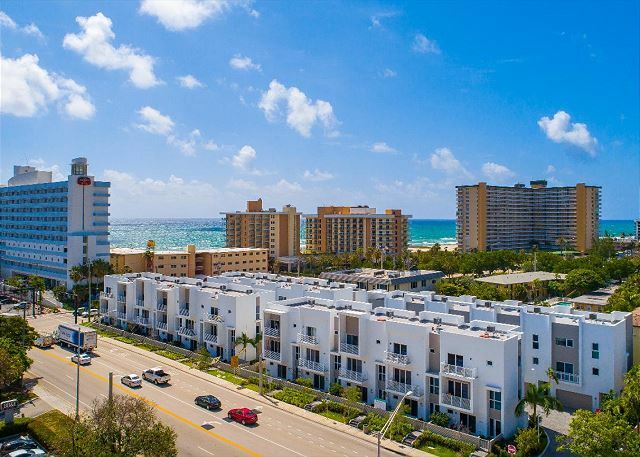 Located halfway between Las Olas in Ft. Lauderdale and Mizner Park in Boca Raton, Pompano Beach has something for everyone. 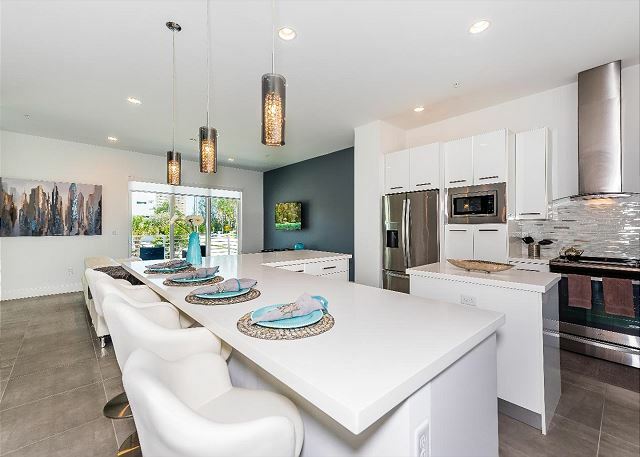 Kids of all ages will love all of the parks, and foodies can indulge at great restaurants.Golfers will appreciate being less than 10 minutes from the Hillsboro Golf Club and the Pompano Beach public course. 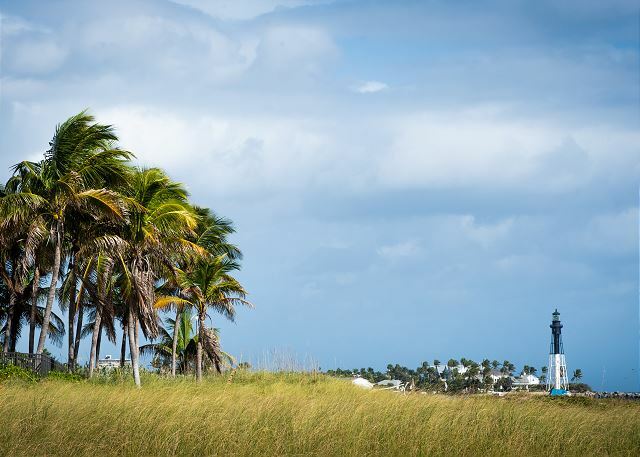 For active family fun there’s North Ocean Park (a 4-minute walk), where you’ll enjoy kitesurfing, boogie boarding, and sunbathing. Give the cook the night off and head across the street to the Seaside Grill for fresh-caught seafood. Affinity Vacation Rentals is the next generation in vacation rental management. We are a tech-enabled, company focused on personalized and quality customer care. 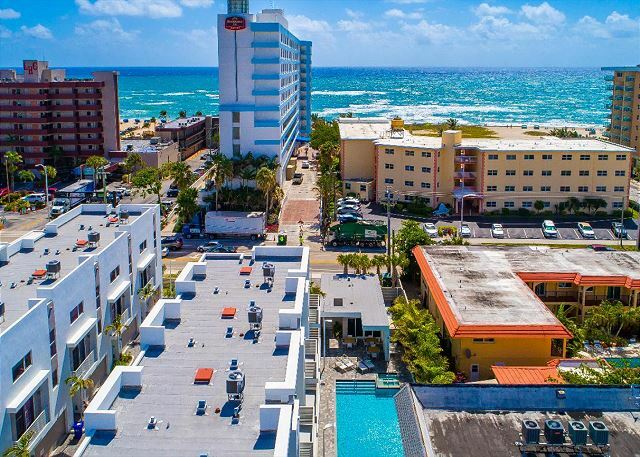 Offering luxury properties, our team is comprised of a visionary group of vacation rental experts and the finest hospitality professionals delivering a stress-free experience and white-glove services for both owners and guests. 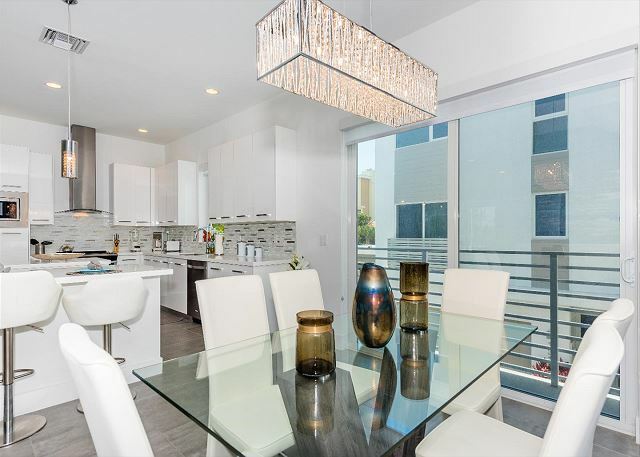 condos that feature comfort and appeal, and treat them as our own. Affinity is proud to bring first-class service, management, and dedication to the vacation rental industry. We love what we do and thrive on creating memorable experiences while meeting new people along the way. Note: Pack 'n play portable cribs and high chairs are available upon request. Call 1-833-4-AFFINITY for more information. The place was was top notch and a walk across the street to the beach. The property manager was the BEST (Jamie). I could write pages of how great the place and people that work there were. I would definitely recommend affinity vacation rentals to anyone and definitely plan to stay there again!